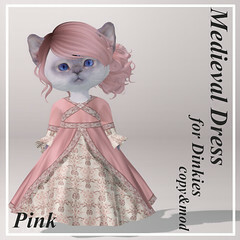 Comes with appliers for body and eyes, and mesh parts. 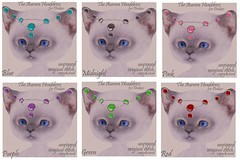 Cheshire Cat inspired texture mods for the Puchimono avatar. I recently updated the Panda mod for Dinkies, and the Tuxedo mod for Dinkies, the mods now use appliers instead of having to drag and drop the textures onto the body, and i’ve updated the Tuxedo textures. For those that have previously purchased these mods, you should’ve received your update already. If not, never fear, just drop by my shop and use the redelivery terminal to get your updated copy. This is the start of a bunch of updates i will be working on over the next few weeks, i will be updating older textures, and making sure mods use appliers where possible, so keep your eyes peeled for your update deliveries! This year i will have a store at the Fantasy Faire 2019! I’m very excited and have been working hard on some products for the event, i hope you will join me there and see the new products i, and all the other participants, have released! And of course its for a wonderful cause. 2 new mods available inworld and on the marketplace, for the Puchimono and Puchimini avatars. Demos are available, come visit inworld!